What would the United States have looked like had microbes and strength of arms not been on the Plymouth Protestants’ side? 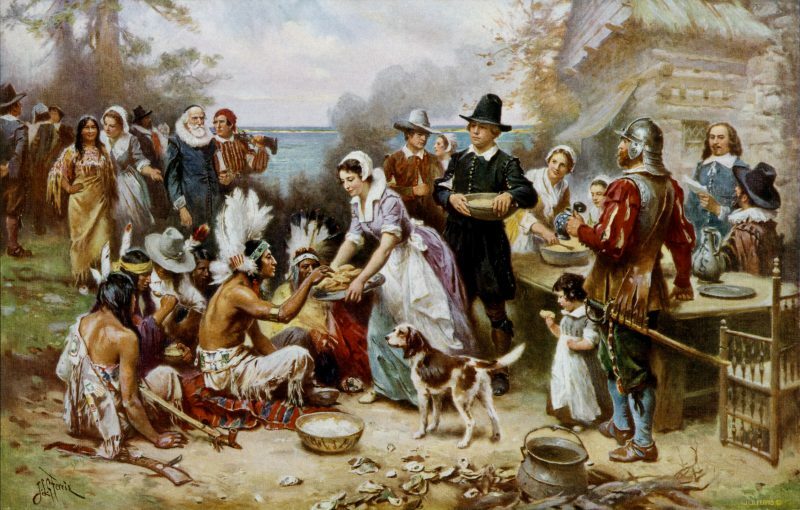 "The First Thanksgiving 1621," oil on canvas by Jean Leon Gerome Ferris (1899). In the movie Our Brand Is Crisis, Sandra Bullock’s character hears upon arriving in Bolivia that it is like “there were two-hundred million Apache back home.” Bolivia’s poverty and racial inequality derive in no small part from the brutally extractive institutions erected by the Spanish to manage and exploit indigenous labor. In contrast, Thanksgiving in the United States is a fat-saturated offering of gratitude for the immense economic prosperity made possible by indigenous conquest. From Labrador to Araucanía, aboriginal people paid a steep price for this success. Today, Americans celebrate one possible historical outcome of their ancestors’ encounter with the native populations, but other trajectories are worth contemplating. The economic historian Douglass North — a complex thinker worth grappling with as well as being a self-described “Marxist of the Right” — blamed institutions for underdevelopment. His argument works the other way, too: The United States boasts about having the world’s greatest democracy, with a broad franchise, extensive civil liberties, and never-fail Whig instincts, leading us to conclude that these institutions are the source of American economic strength. So the standard story goes. To be sure, as Daron Acemoglu and James Robinson have argued, where settlers enjoy military and ecological advantage, they erect social structures that deliver economic growth and relative political equality within the settler population. Of course, the viability of these settler-only colonies depends on decimating indigenous populations. The brutal dispossession and death borne by locals built democracy and long-run GDP growth for the descendants of the settlers. But what about the folks on the losing end of that encounter? Would the United States appear so prosperous without Native American population collapse? While counterfactual history over five hundred years looks more like speculative fiction than social science, we can conjecture that the United States would look much more like apartheid settler states — Israel or predemocracy South Africa, for example — were it not for the epidemics and wars that wiped out the local population. Can we account for the ghosts of five centuries of missing people? If destroying aboriginal resistance was the cost of economic development, perhaps we should rescale contemporary prosperity to account for the mass killing required to secure it. Henry Dobyns estimated that the Timucuan-speaking population in Florida was 722,000 in 1517, dropping to 36,450 by 1613–17, suggesting comparable population collapses across the Southeastern United States, where density and social complexity were quite high. At contact, somewhere between two and eighteen million Native Americans lived across North America, with some estimates outside these bounds. Let’s take the midpoint of these numbers — around ten million in 1500 — and extrapolate the population structure we would have today if they had been allowed to embark on normal demographic trajectories. Rich theoretical dynamics of population growth, involving age structure, disease load, food availability and all that, would of course give us a clearer and more accurate picture. But let me abstract from these nuances and just give a simple calculation, taking an estimate of indigenous populations in 1500 and an informed guess for population growth. If ten million Native Americans experienced .5 percent population growth — a possibly conservative figure, considering indigenous populations were likely nowhere near the carrying capacity of the environment (world population growth has been almost 1 percent per year over the twentieth century, maxing out at 1.18 percent) — then the United States would currently have at least 130 million natives. If they had been treated the same way Protestant colonialists treated other native populations — segregation with little intermixing — the resulting impoverishment would have radically reshaped the American social landscape. Counterfactuals on this scale are tough, but in the spirit of Kim Stanley Robinson, let us give it the old science-fiction try. The two graphs show the relative Native American population two different ways, and the actual population trajectory versus the simulated one under normal demographics. As can be seen from the bottom graph, even with conservative assumptions, Native Americans would account for around 35 percent of US population in today’s alternate universe. Let’s assume that American society repressed and excluded natives no more and no less than it does in the real world, and so suppose that they would earn the income per capita of current Native Americans, roughly $18,000 a year. American GDP per capita would fall from $54,000 to something like $40,000, roughly equal to France. Inequality would obviously be much greater, something like what contemporary Colombia — the world’s eighth most unequal country — experiences. Of course, these are just rough calculations, and the entire exercise is pretty speculative. But the effects of this thought experiment ripple out in fascinating ways. The whole American social structure would obviously have changed. The political institutions required would have probably made the United States more like Latin America than the United Kingdom. Colossally larger humanitarian disasters — massacres, population displacements, and internment camps — would have been necessary to keep the native population separate from the settlers. Slavery on a large scale would likely have been maintained. Columbus turned first contact into the first Atlantic slave trade, filling boats back to Spain with captured Native Americans. Recent scholarship has shown how violence and coerced labor played an important role in creating the conditions for population collapse in the New World. Just as European slave demand amplified pre-existing slave systems beyond recognition in Africa, so too in the New World. According to historian Andrés Reséndez, between 1670 and 1720 Carolinians exported more Native Americans out of Charleston than they imported Africans. The history of the other Providence suggests that Puritans didn’t oppose slavery if economic returns went high enough. The northern Puritans certainly tried to follow the Spanish example, but found the indigenous population too resistant to keep captured locally. So Massachusetts clamors for a “juste warre” against the Pequots, to capture native slaves to trade for black slaves from the Caribbean. While disease is likely the main culprit behind early native population collapse, its killing potential was amplified by forced sedentary settlement, forced population movements, and forced labor induced by indigenous slavery. Pathogens thrived in a malnourished, overworked, and congested population. Would the United States have engaged in the African slave trade with as much gusto if it had a domestic source of coerced labor? Even with a large native population, African slaves’ value could have been high — the malaria introduced by the colonists would have favored African immunities — and would have just meant much larger Cherokee and Choctaw populations to evict from the Southeast and much larger reservations in the West. Or perhaps not — had Native American population growth followed general demographic trends, the United States would probably look more like Mexico or the Andean countries than it does like Europe. Settler colonies, like those that eventually became the United States, may have wound up with social structures that created more economic development relative to other colonies, but this is largely by accidents of guns, germs, and steel chains rather than by design. Nothing about European culture granted contemporary Americans the relative economic comfort they’re celebrating today: it was that early colonists eradicated, rather than enslaved, the indigenous population. That’s all that differentiates the Plymouth Protestants from the Spanish conquistadors or the South African Boers.